LAHORE/PESHAWAR: The leader of the Pashtun Tahaffuz Movement (PTM), Manzoor Pashteen, has reportedly been barred from entering the premises of his former university, the Gomal University in Dera Ismail (DI) Khan. “On the directives of the worthy vice chancellor, both the campuses (New and City Gomal University), are out of bounds for Manzoor Mehsood, ex-student of the university, with immediate effect,” read the notification which is circulating on the social media. The news has not been confirmed by the university itself, however, the representatives of Gomal University have refused to comment despite multiple attempts by Pakistan Today. It is worth mentioning that a few days ago (April 15), a visit by ‘state functionaries’ to Gomal University was reported, in which the faculty and administration at Gomal University were questioned about the content of their courses. The faculty and administration were also reportedly given a warning to not teach subjects that would “encourage critical thinking amongst the students”. It is being speculated that the supposed barring of Manzoor Pashteen from campus might have to do with this visit, and maybe the result of coercion or pressure. While the reason behind the ban on Manzoor Pashteen’s entry cannot be described, copies of the notification were also issued to high ranking civil, military and police authorities both in Peshawar and DI Khan. The PTM stalwarts have confirmed imposition of the ban, but haven’t reacted to it so far. Meanwhile, under the auspices of Pakistan Zindabad, a rally was held at Timergara, headquarters of Lower Dir on Tuesday, where the speakers criticised Manzoor and his organisation. Some of the speakers at the rally also accused Manzoor and his organisation of being “sponsored by enemies of the country like India and Afghanistan”. It is pertinent to note that from the last several days, protest rallies and statements of the tribal elders against the PTM, its leaders and demands are in progress. The PTM, an organisation advocating for the rights of those who have been affected by the war against terror, has been staging protests in different parts of the country against the enforced disappearances and extrajudicial killings. 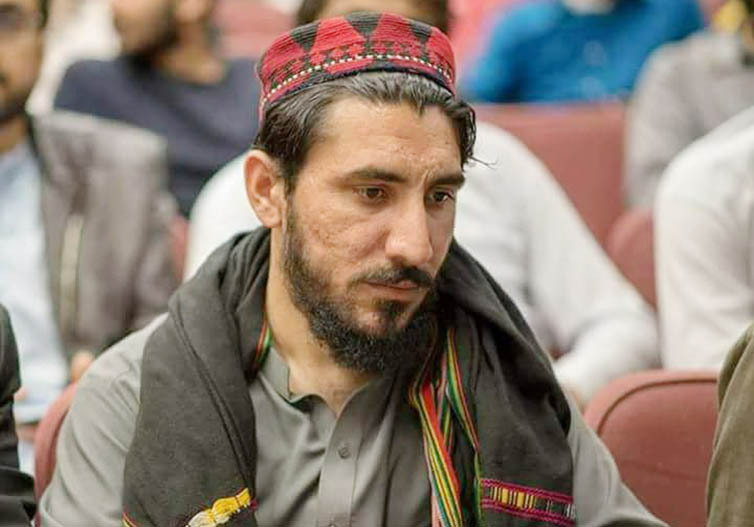 The PTM leader Manzoor Pashteen, within the past few days, has had come under severe criticism for speaking against the alleged mistreatment of the Pashtun community at the hands of the security forces. Pashtoons are proud people and they love Pakistan. I am proud of my brothers. The man has hijacked the movement that was meant to get justice for mehsud’s extra judicial murder by Rao Anwar. He has raised anti army slogans that are nothing but accusations in his rallies. Ye jo dehshat gardi hay…. is k peeche wardi hay. In one rally he tells people to say fauj as an answer to his questions. Who is behind Army Public School massacre? Who is lifting pashtuns from homes? They look more like accusations rather than critical thinking. Shameless that you allowed such a badly written article to be published. So in your opinion what should the universities do? Should the university allow him with his dubious campaign and anti establishment agenda? Shouldn’t universities be places of learning and not seats of political or Manzoor pushtoon who is on anti and pro unclear agenda? Should we be demonizing universities because it didn’t allow an ex student or graduate to hold extra-educational activities or rallies? Freedom of speech and critical thinking is good but we must understand that it is not only you, who is objecting is allowed to criticize the other who are of different opinion do have the right to express themselves. In this case any one who is expressing the opposite version of Manzoor Pashteen is branded as pro establishment and anti to freedom of expression, which is absolutely bazzre and wrong. I my opinion the university has all the rights to decide who it should allow and whom it should barr from entering it’s premises.